THE VEHICLE SCRAPPAGE SCHEME: Figures released by the Society of Motor Manufacturers and Traders (SMMT) for July show 21% of the total 157,149 new car registrations were as a result of the scrapping incentive scheme, giving a much-needed boost to the UK motor industry. In the commercial vehicle sector, 499 vans were registered under the plan, accounting for 1.5% of the total scrappage registrations and 3.6% of overall van registrations in July. AUDI: A new low emission fuel efficient 1.6 TDI diesel engine has been introduced by Audi for its A3, A3 Sportback and A3 Cabriolet models priced from £17,485 to £20,645. Replacing the 1.9 TDI units, the new engine is claimed to return up to 68.9 mpg with the help of start-stop technology and to emit as little 109g/km. ROLLS-ROYCE: The new Rolls-Royce Ghost, due to debut at the Frankfurt Motor Show in September will have 563 bhp, be capable of reaching 60 mph in 4.7 seconds and will have a top speed of 155 mph. PEUGEOT: An ultra clean version of the Peugeot 207 will launch in October. Called the 207 Economique is will have emissions of only 99g/km from its 1.6-litre 90 bhp HDI diesel engine. Price will be £12,995 on the road. HUMBERSIDE POLICE: The North East force have taken delivery of a Lexus IS-F in order to make life more difficult than ever for those looking to travel to the region to commit crime. Specially trained officers spent 12 months evaluating a number of high performance vehicles that are set to replace the current Subarus which have proved highly successful in enabling the Roads Crime Section to target organized criminals in the area. Following a stringent evaluation process the decision was taken to purchase the Lexus IS-F after the vehicle proved to be exceptionally capable of remaining stable in high speed operational policing environments, despite carrying the extra weight provided by the £30,000 worth of on-board computers and communications equipment. Not so many years ago SEAT produced a competent saloon model called the Toledo, it reminded me of a BMW 3 Series and actually received praise from a former BMW executive colleague. As a regular driver in Spain I saw a lot of those Teledos obviously being used by business drivers and when the car was replaced by the more family orientated Toledo hatch back I commented that Spain’s business executives had been left high and dry. So the arrival of the SEAT Exeo must be just what executive car users, primarily in Spain but I suggest probably throughout Europe were waiting for, especially in these more stringent times. This new executive class offering comes with good credentials, the basis is the previous Audi A4 but seriously reworked to take advantage of the Volkswagen Group’s recently introduced common rail diesel engines and to enhance the handling and ride qualities as well as a new nose job to meet the NCAP pedestrian safety tests. Launched in the UK this spring, the Exeo took just 18 months to create, a notable feat that involved moving the ‘old’ Audi A4 production line to the ultra modern SEAT factory just outside Barcelona. Currently the range is based on a pair of 2.0-litre diesel engines rated at 141 and 168 bhp and a 2.0 petrol unit delivering 198 bhp. Future plans include a less potent entry level diesel unit due soon plus a Sport Tourer version. A CVT automatic transmission is planned as an option on the petrol version in place of the across range manual 6-speed manual unit. Tested here is the 141 bhp SE diesel powered version which sits approximately in the middle of the seven-car line-up and comes with an impressive standard of trim and equipment in what is close to an Audi in most respects but with a price tag that benefits from short cut development and the strong component buying power of the Volkswagen empire. The SEAT has a good chance of attracting those company car buyers who are given a budget and told to make the most of it. Visually it has modern looks (let’s face it the old Audi A4 only came out eight years ago and was refreshed less than five years ago) and is sized I would say close to a BMW 3-Series yet will take five adults providing those in the rear seats are none too lanky or are the uncomplaining type. Boot capacity and the size of aperture could prove critical – roll on the Sport Wagon! Internally there is a ring of quality about the cabin and no wonder as it is virtually a straight lift from Audi which means a battery of metal rimmed air vents, clear no-nonsense instrumentation and strategically located switch gear. There is an air of substance about the interior, making me feel that in one action SEAT has made a great leap forward in the quality saloon sector. The driving position is comfortable with good support and lateral location, bags of adjustment and is complemented by well above average driver visibility. 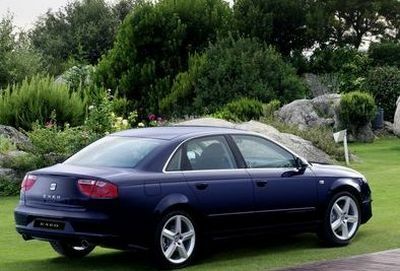 I have always praised the driving characteristics of the Audi A4 though I respect the views of colleagues who complained that it was a bit unsettled. Well, SEAT’s team has further developed the fully independent suspension system in two directions – a firmer one for the Sport model and a more compliant one for the other models including this SE. I would say that if they have done a good job, the handling easy but with sufficient character to satisfy those who enjoy their drive and also those who want to achieve long journeys with minimal effort. The ride reasonably well insulated and stability is also a strong point, aided by an electronic Stability Programme. Add to that a braking system aided by both ABS and EBA that one soon takes for granted plus a positive changing six-speed gearbox with cruise control (now necessary for all those tediously long speed limited road works!) and the verdict is a very satisfying car. So far so good but what does this engine deliver? For a start it is a lot quieter than the Pumpe Duse engines used for so long by the Volkswagen family and also a lot smoother. There’s great flexibility with the confines of diesel engine speeds and sufficient power to provide a top speed of 133 mph (according to SEAT) with 60 mph possible from rest at around nine seconds. Importantly the engine power and gearbox work well together to an extent that it is easy to forget this is a diesel car. Equipped to the dictates of the modern business life, the SEAT Exeo is an agile car that seems just the job for those that have to do a job. Welcome back to the junior executive class SEAT! From £18,345 on the road.